Searching for a Home Appraisal in Brookshire, TX? Our Texas certified real estate appraisers perform residential and commercial appraisal services throughout the Brookshire area for both private use and lending usage. We aim to deliver an appraisal report that meets our customers’ needs and is delivered with an industry leading turn time. Not only do we complete our appraisal assignments faster than typical appraisal businesses, we maintain some of the lowest fees for appraisal services in the area. All of our appraisers are Houston area natives and have over a decade of experience in the market area. We employ appraisers capable of handling all assignment including residential, commercial or mixed-use. If you have a commercial property assignment, most of our Texas Certified General appraisers hold the MAI designation from the Appraisal Institute and are available across a large portion of SouthEast Texas. Furthermore, our appraisers can perform valuation services for any use including lending, private issues, insurance, legal concerns and any other scenario that requires an concise and reliable property value. We are devoted to providing competent, friendly and prompt services to all our clients be it homeowners or industry pros. If you’d want to go over your appraisal needs in more detail please connect with us via the phone number on this page or the online contact form found above. 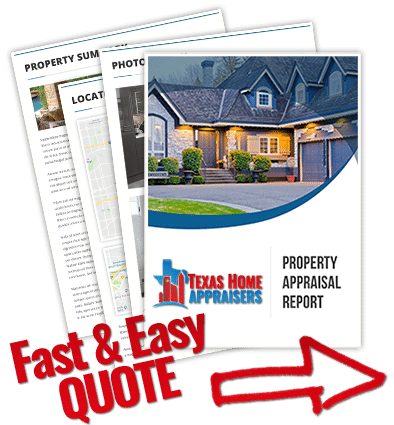 If you need a local houston house appraiser to provide a quick and friendly appraisal for your home, give us a call now or fill out the fast web quote form. Is price per square foot something that appraisers pay attention to? A common misconception is that an appraised value is based on square footage and that the value can be determined by square footage times price per square foot. This is inaccurate. In fact, it’s the other way around; price per square foot is determined by the value assessed by the appraiser. For example, a smaller fully-remodeled house could actually appraise more than the 1970s-condition larger home next door. Do appraisers use sites like Zillow or Trulia? Absolutely not! Those sites are not a reliable source of data. Instead, appraisers mainly rely on the local MLS to find reliable sales and listing data. Appraisers can also use comps not sold through MLS if they are available, but ample documentation must be provided. Most appraisers are not fans of the online valuation sites due to their misleading and often outdated information. We understand why folks use them and if we had to pick one we like Realtor.com as it’s the most reliable information. Do appraisals include a home inspection? No. Appraisals and inspections are two completely different industries. Inspections involve a licensed home inspector or contractor who evaluates the structure and mechanical systems (heating, plumbing, air-conditioning, etc.) of a house, from foundation to rooftop. An appraiser will only perform a visual review of the home before completing his appraisal report. What is Highest and Best Use in an Appraisal? Typically, highest & best use means the use or utilization that provides the most profitable return on investment. For a highest and best use to be acceptable it must be legally permissible, physically possible, and adequately supported when all legal and probable alternatives are considered.